How and why does someone become a sports uniform history expert? My name is Scott Sillcox and I am from Toronto. For sixteen years I owned a company called Maple Leaf Productions (mapleleafproductions.com) and we specialized in making and selling products that celebrated the history of NFL, MLB, NHL, NCAA football and CFL uniforms and stadiums / ballparks / arenas. As a result of well more than a decade of uniform and stadium research, I became quite knowledgeable in this wonderfully odd field of study. I have uniform history files for virtually every year of every NFL, MLB and NHL team as well as select NCAA football teams. Want info on the 1926 Packers? The 1895 Phillies? The 1928-29 Bruins? The 1893 Penn State Nittany Lions football team? I've got it. So if you love the history of NFL, MLB, NHL and/or NCAA uniforms, come celebrate with me! For my first blog, I wanted to explain how I got hooked on this whole business of sports history by paying homage to a grandfather – I promise that future blogs will be far more focused on actual uniform and stadium/ballpark/arena history. I was lucky enough to get to know three of my four grandparents quite well – all three lived long lives and I can’t say enough about them - they shaped my life. One of my grandfathers, Bert Powell, lived his whole life in/around Toronto. From the age of 12 he made his living in the field of advertising and promotion, and his most visible job was working for the Canadian National Exhibition (CNE) for many years as promotion/publicity director and later as General Manager. During his time at the CNE, it came to be that a building was built on the CNE grounds that was home to both Canada’s Sports Hall of Fame as well as the Hockey Hall of Fame – you entered in the middle of the building, paid your admission and then could turn east to go to the Sports Hall of Fame or west to the equal-sized Hockey Hall of Fame. Somewhat in conjunction of the opening of the Hockey Hall of Fame, the NHL commissioned a long time sports writer, Charles L. Coleman, to write a history of the Stanley Cup – a two volume set called “The Trail of The Stanley Cup” – Volume 1 covered the years 1893-1926, Volume 2 covered the years 1927-1946. Mr. Coleman subsequently wrote a third volume covering the period 1947-1967. These are beautiful leather-bound books, each of which comes in its own leather-bound box. Thanks to Grampa and his role in helping to create the Halls of Fame and locate them at the CNE grounds, I am one of the lucky ones. I am not an overly materialistic person, but these three volumes are a hugely prized possession and I have often played the theoretical game of what possession I would save from my house if it was burning and I could only save one thing? 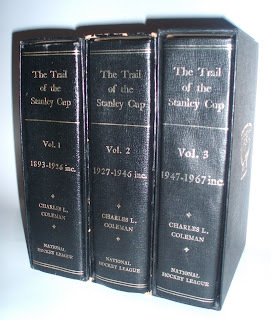 I love my photo albums and various other family treasures, but my answer is invariably Charles L. Coleman's "The Trail of The Stanley Cup – Volumes 1, 2 and 3". These Volumes are nirvana for a hockey fan, a history fan, a sports trivia fan. They capture a period of time that seems long gone and yet when I crack open the spines of any one of the volumes, I am immediately transported back in time. And for me, they are the reason I became a lover of sports history. 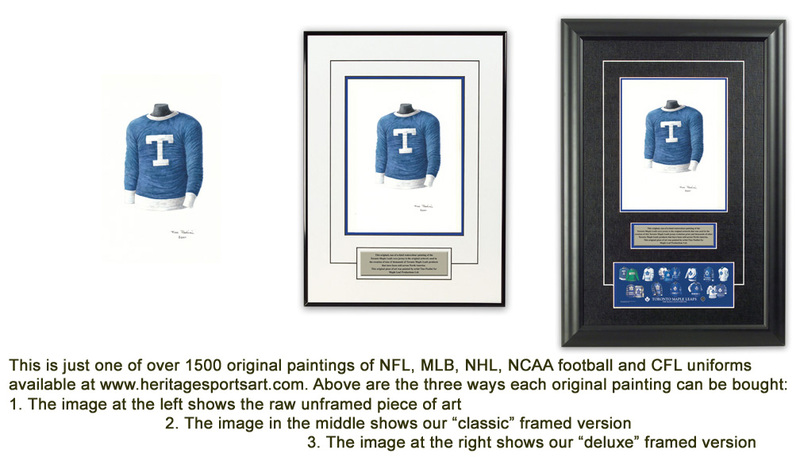 These volumes contain one other treasure created by Mr. Coleman - simple, hand-drawn color sketches of jerseys - some samples of which are shown below. 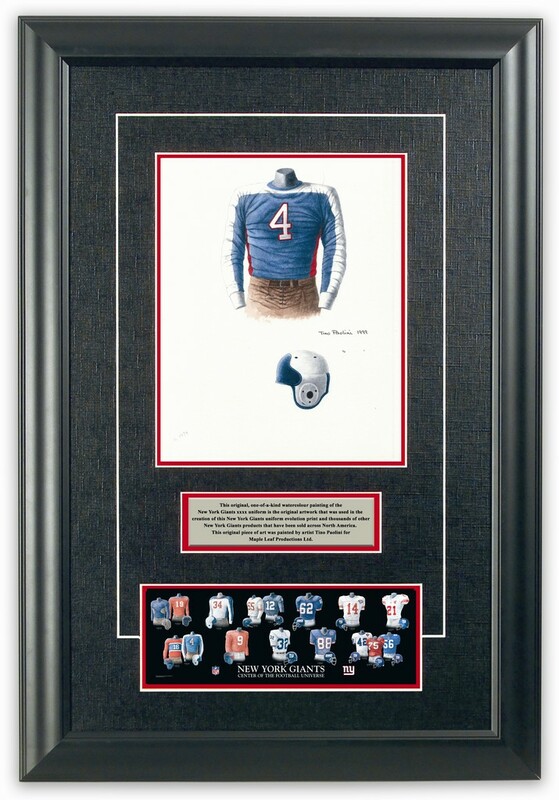 It is these sketches that made me fall in love with the history of jerseys and uniforms. And it is these sketches that later inspired me to create a collection of 2000+ images of NHL, NFL, MLB, CFL and NCAA uniforms. And that's how someone starts along the odd path of becoming a sports uniform history expert.